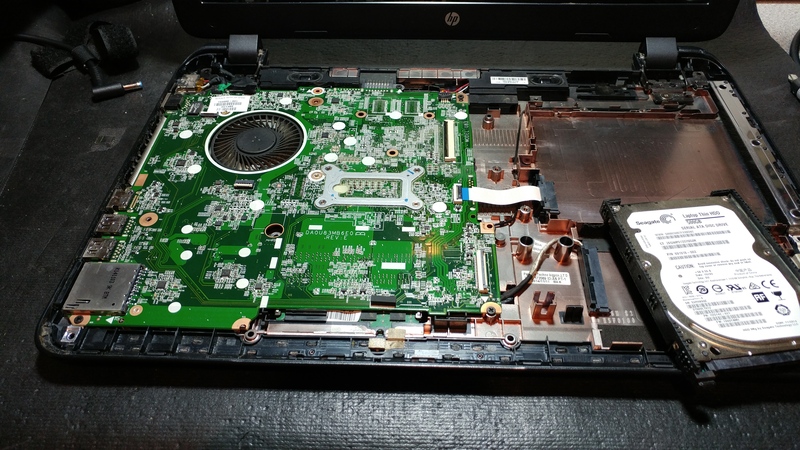 This is the second HP laptop that a customer has brought in which had power issues. The customer for this particular system told me that there was a boot error that Windows showed which needed to be repaired. He did not mention anything about a power issue. Why does this laptop turn on briefly, and then shut off? When I tested the laptop briefly in front of the customer upon intake of the device, it powered on briefly once the lid was raised, and showed the error as mentioned, then powered off immediately. This fast power off was brushed off in my mind as simply the battery must not have been charged or perhaps was no good. Once the system was in my lab I found soon enough that the laptop would not power on via the power button at all, and only would stay on for a second to show the error, and power off quickly, the same thing as the first time I saw it. Now I’m thinking this is a hardware problem, so I proceeded to disassemble the laptop. Disassembly also had to be done in order to gain access to the hard drive, and without a functioning system, this was the only way to access the customer’s files, which I was told they desired to retrieve. Many laptops have a hard drive that can be accessed via a small door underneath, this is not one of those models. Now having access to the hard drive, the data was copied to my server, in anticipation of moving to a thumb drive for the customer later. With the data safe guarded it was time to diagnose the hardware problem. However, no hardware issue was found! Now, in the process of removing the hard drive, the entire system was given a thorough cleaning. There was extensive dust, grime, and particles everywhere. This could have contributed to the power issues, and was part of my initial thought, as before re-seating everything back in the laptop casing, the system was tested as stated above, and it powered on every time! Another thought I had was the possibility of a bad/intermittent dc power jack. HP laptops have issues with the dc power jack quite often. The power issue could NOT be duplicated at this point, however. So, I proceeded to repair the Windows boot error. Now the HP laptop boots up and no longer has a power issue, great! Everything was re-seated back in the laptop casing, then several reboots and power down/power on testing cycles later with no further issue, the system was ready for pickup. The customer arrives, and is ready to just take the system and go. My policy, however, is to test the system in front of the customer before they leave. The laptop was turned on via battery power only. The login message pops up for Windows, and the customer logs in, feeling happy, but only briefly. The system immediately powers off! I explained to the customer the power issue and the most likely possibility of the dc power jack being the culprit. I also asked if this power issue ever happened before, he stated he wasn’t sure. His additional charges were cleared and only the minimum fee was charged. He’s not sure if he wants to spend the extra cost in repairing the laptop power jack. If you decide to bring your system to me for repair, virus removal, or any other service, you’ll find that I am very forth coming with what I find. Sometimes I even recommend that a system not be repaired, based on cost, part availability and other factors. Recently a customer from Syracuse came to me for laptop repair and I told him that very thing. If you appreciate honesty and integrity, please contact me to service your system. You can also call 315-676-9096 for an appointment.